The 2017 Chevrolet Silverado 2500HD has the gear contractors need… and some they may not expect. There are millions of trucks on the road. Many of these trucks get used as commuter trucks or rides for weekend warriors, despite being capable of far more. On the other hand, heavy-duty trucks are constantly pushed to their limits on worksites across the country every day. The 2017 Chevrolet Silverado 2500HD is built for the latter. Not only does it have an all-new diesel engine with impressive power and torque, it has a series of unique features that will make life easier for contractors and folks at worksites everywhere. There is no chance that anyone will lose the Silverado HD in a crowded parking lot. 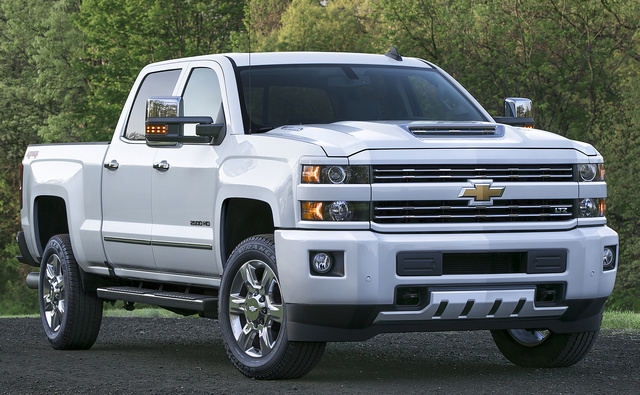 It features the crisp, straight lines and split-bar grille it shares with the Silverado 1500—there's just more of it. The grille is quite a bit taller, the hood is something off a Tonka truck, and it has heaps and heaps of chrome. 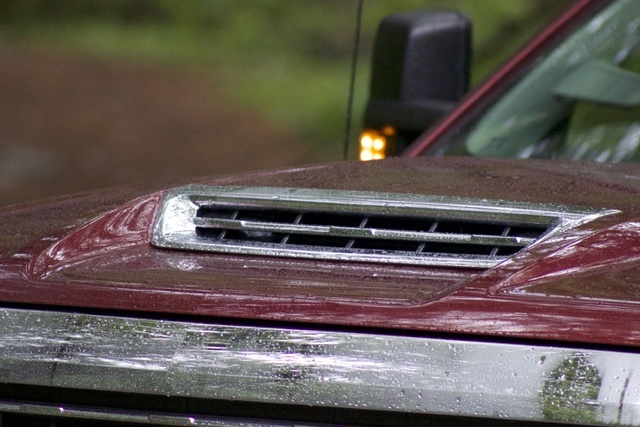 There is only one major styling addition for 2017: the large hood scoop, and it's only for diesel-engine versions. We were pleasantly surprised to learn that this scoop is actually functional, feeding the big diesel V8. Climb up behind the wheel, and operation should feel familiar to anyone who has been behind the wheel of a Chevy truck in the past several years. 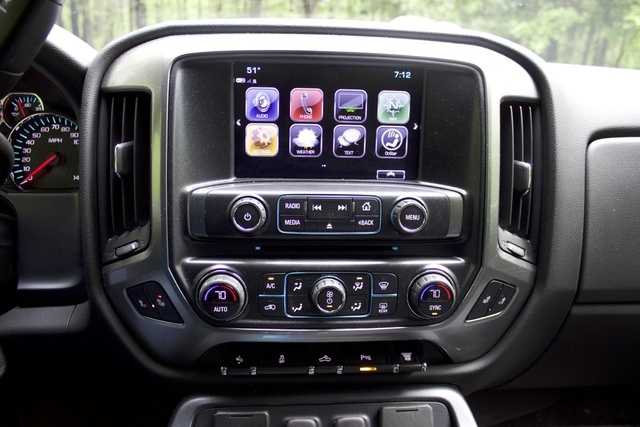 Interior controls are straightforward, and Chevy knows not to mess with a good thing. But that doesn’t mean the Silverado HD is spartan by any means. Our LT Double Cab model comes with plenty of creature comforts, including the easy-to-use MyLink touchscreen system and its tablet-like layout. Bed/cab configurations include regular cab and long bed, double cab and standard bed, double cab and long bed, crew cab and standard bed, and finally crew cab and long bed. The double cab is essentially an extended cab, but unlike the clamshell doors of some competitors, Chevy's double cabs feature conventionally opening doors. We drove the double cab model with the short bed, making for one of the shortest configurations of the Silverado HD you can build. The standard engine for the Silverado 2500HD is a 6.0-liter V8. It makes 360 horsepower and 380 pound-feet of torque. But we’re not driving the gas V8. We’re driving the available 6.6-liter Duramax diesel V8, and this engine is the big news with the Silverado Heavy Duty in 2017. Chevy claims this engine is 90% new, makes 445 horsepower, and more importantly, makes 910 pound feet of torque. Power gets sent through a 6-speed Allison automatic transmission to the rear wheels or, in the case of our test vehicle, the available 4-wheel drive with low range. The new diesel engine is not only quicker than the 2016 version, but it’s also surprisingly quiet. That is, of course, until you lay into the throttle. From the driver’s seat you can hear that terrific whine of the turbo spooling up, and it makes a great exhaust note. Throttle response with the diesel is quick, and acceleration is strong. The strange thing is, it struggles to get into the overdrive gear when driving around town. Our test truck is spec’d out with the 3.73 rear-axle gearing, as opposed to the 4.10 rear axle. 3.73 means taller gearing, so any issue with gearing at around-town speeds has to be the transmission looking for overdrive. The lower the number, the more smoothly your engine will run at cruising speeds. The higher gear-ratio number is better for towing, when you want the engine revving into peak power. 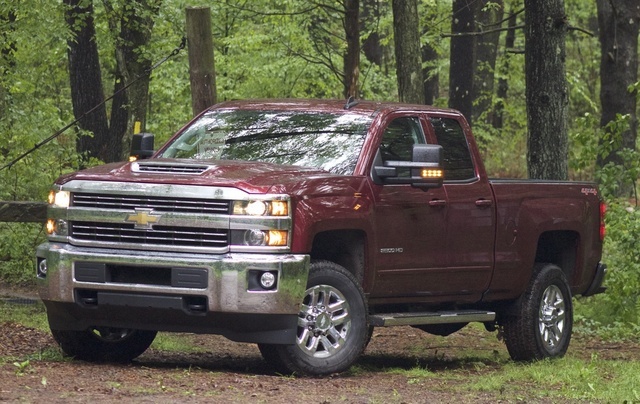 When properly equipped, the Silverado can tow as much as 18,100 pounds. While that figure sounds like a lot, the Ford Super Duty has that beat at 21,000 pounds. 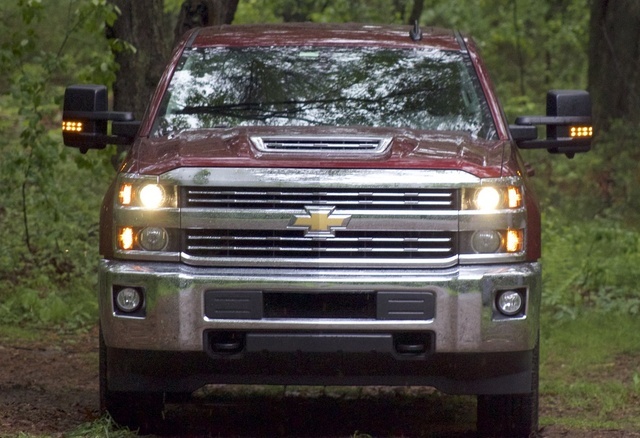 If you want more out of the Silverado, you need to go up to the 3500HD, which has a towing capacity of 23,300. However, that number requires fifth-wheel towing. When you get to that level, Ford still has Chevy beat, with a fifth-wheel towing capacity of 27,500 pounds. Still, our test model is capable of moving things like horse trailers or flatbeds carrying mini excavators with total ease. It will even tackle hills and corners easily. Its turning radius feels surprisingly tight. That this is one of the shorter body styles helped with maneuverability, especially in some city driving. Because these are commercial grade vehicles, the EPA does not require fuel-economy numbers to be posted. But whether it’s you or your employer, someone has to pay to fill this truck up, so fuel economy numbers matters. In our week of mixed driving, we found fuel economy of 16.6 mpg. You can compare that to our week in the Ford Super Duty, when we got combined fuel economy of 15.9 miles per gallon. 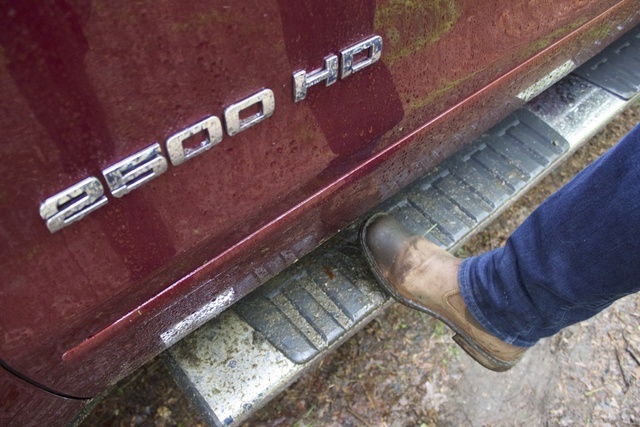 It’s a big climb up to the cab, but the Silverado HD provides large side steps. However, the steps are not ideal—they're made out of hard plastic, and the grooves face outward. If mud gets on them, they will get slippery. It would be better if the grooves ran the length of the side steps. We recommend that some owners in muddy or snowy regions consider aftermarket side rails, with perhaps better grips for your work boots. Luckily the corner steps, spray-in bed liner, and EZ lift-and-lower tailgate all make working with the Silverado HD a snap. The cabin controls are straightforward and feature large dials for the radio volume, tuner, and climate controls. We’ve repeatedly said these features need to be easy to use. If you’re headed to the worksite before the sun's up, there is no easier design choice for those early morning workers than dials and buttons. The center console features a deep well, but also comes with plenty of power points, USB ports, and an available wall-style power-outlet. There are many ways to power all your gear in here. The base infotainment unit is a small 4.2-inch color screen. If you can afford it, go for the larger 8-inch MyLink touchscreen infotainment system. It has a very easy-to-use layout, with large home screen icons and easy moving about the menus. These are available with and without navigation, but even if you don’t have navigation, you can tap into your own smartphone’s maps app using Apple CarPlay or Android Auto integration. Such support is also a great way to send and receive text messages by voice control and offers easy access to podcasts and music apps. The Silverado’s navigation system also has real-time traffic and weather forecasts. You can also cycle through radio presets on the trip computer, and you can save AM, FM, and SiriusXM presets simultaneously. The reversing camera is large, vivid, and has active guidelines that turn with the wheel. However, the most helpful safety feature is the pair of cameras built into the side mirrors. When you click the turn signal to one side, it activates that camera and presents the image on the center screen. 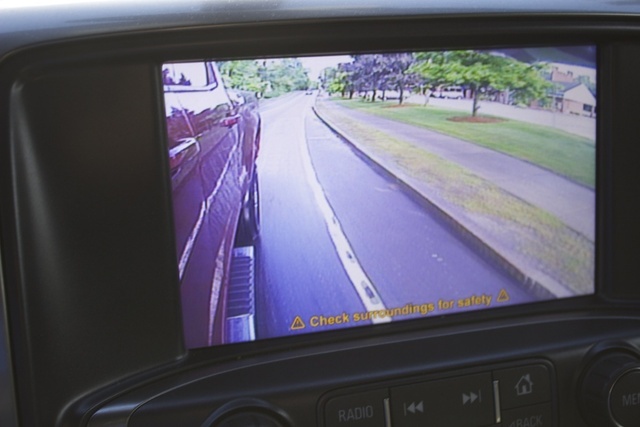 This is similar to the feature pioneered by Honda with LaneWatch, but while LaneWatch covers only the driver’s-side blind spot, Chevy’s system covers both sides. This camera system is extremely helpful when checking clearances on tight corners. Drivers sit up so high in the Silverado HD that the system will help checking blind spots when making a lane change on the highway. With the amount of towing you’d expect out of a heavy-duty pickup, the Silverado HD provides the latest trailering safety equipment. This includes features like trailer brake control and the ability to cycle through all the cameras while you’re towing. But for the truly seasoned tower, the low-tech wide-angle mirrors on either side will be more than enough to get the job done. Base MSRP for the 2017 Chevrolet Silverado 2500HD is $33,610. That’s for a rear-wheel drive Work Truck trim. That base price nets you the gas V8 engine, 4.2-inch color screen, 4 speakers, and a USB port. From there, other trims include LT, LTZ, and High Country. An LT starts at $38,175 and adds features like the larger MyLink touchscreen, 17-inch aluminum wheels, heated seats, a leather-wrapped steering wheel, and Bluetooth connectivity. An LTZ trim starts at $45,945 and adds features like leather seating, dual-zone automatic climate control, remote start, and even more chrome on the mirror caps and door handles. The top-tier trim is the High Country, which starts at $54,685. The High Country swaps out a lot of the chrome for color-matched bumpers, a unique grille design, and 20-inch wheels. We tested the LT double cab, with options like the LT convenience package, which adds plenty of creature comforts, for $1,425. Those creature comforts include a power driver’s seat, front fog lamps, dual-zone climate control, tilt steering column, remote vehicle starter, and a 110-volt, wall-style power outlet. Other options on our test model included 18-inch chrome aluminum wheels for an additional $1,295 and, of course, the Duramax V8, which added $9,340 to the price. With all the other little odds and ends, our LT—not an LTZ or High Country mind you, but an LT—carried a sticker price of $62,575. But that’s the heavy-duty price of doing heavy-duty business in 2017. The price of our test model gets you the diesel engine, but also innovations like those available side cameras. Unique features like that will not only make life a bit easier the next time you have to tow, but will continue to make the Silverado HD a fixture at worksites for decades to come. What's your take on the 2017 Chevrolet Silverado 2500HD? Users ranked 2017 Chevrolet Silverado 2500HD against other cars which they drove/owned. Each ranking was based on 9 categories. Here is the summary of top rankings. Have you driven a 2017 Chevrolet Silverado 2500HD? Truck speeds out of control after switching from drive to reverse. Truck died and restarted, put in reverse then truck went backwards fast out of control. How many years will a pair of 2017 Chevy 2500 High Country headlights fit? Is a V8 flex fuel truck an alternative to a regular diesel truck? If so would I be able to put regular diesel in it.? I INSTALLED AN IO6 NAVIGATION UPGRADE ON MY 2017 SILVERADO 2500HD. THE SCREEN NOW READS "THEFT LOCKED". AND WILL DISPLAY NOTHING. HOW IS THIS RESET? Anyone Got A Tune On The 2017 LP5 Duramax?